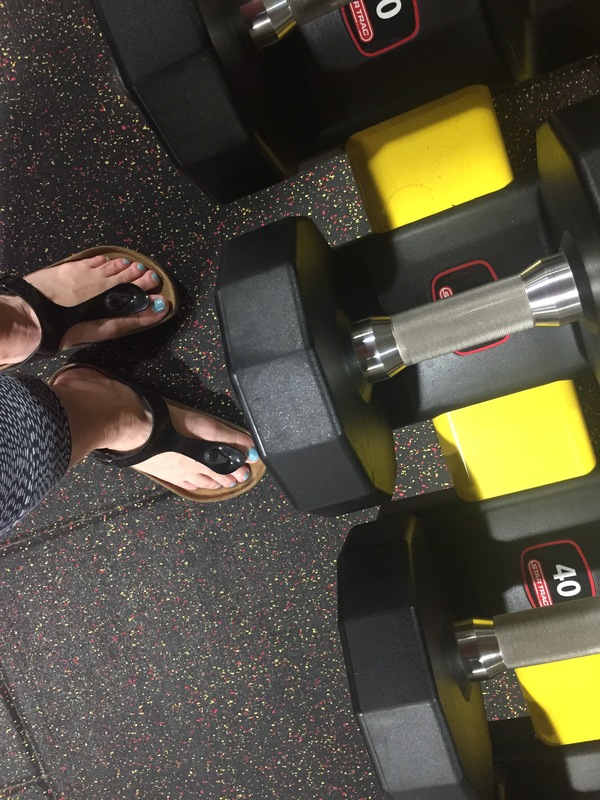 What do you do when you show up at the gym and you’re reaching for the dumbbells, and you notice your footwear is, well German and a bit boho? I decided that I could do my arms workout sporting these really cute patent leather Birkenstocks. Trust me when I say, there were a lot of double takes. Cue funny footage (pun intended) of grown people glancing sideways at my feet, (confusion rising in their faces,) then up at me then back down to my feet. Oh, and I was acting like I picked those shoes out specifically for lifting. Granted, it was early and okay, maybe a bit confusing, but I’m just super glad that I didn’t freak out when I noticed my fashion choice back in the free weights and turn around and leave without doing what I’d come to do. I could do arms in stilettos, for gosh sakes. OK, that’s a lie. I couldn’t even walk in stilettos. The good news is that I didn’t drop one of those burly, huge, superheavy, free weights I was working with on my little blue toenails. Mission accomplished suckers. Don’t be surprised if this latest fashion trend starts popping up in your gym. Just saying! Here’s to hippie lifting. It could be a thing.